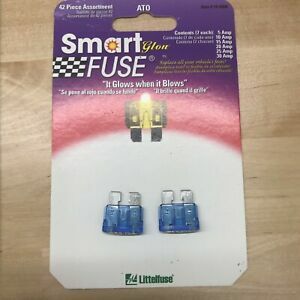 TWO (2X) Littlefuse Smartglow ATO 25 amp ATO Fuses - 100% new never used! TWO (2X) Littlefuse Smartglow ATO 30 amp ATO Fuses - 100% new never used! jdebler has no other items for sale. Please read entire description carefully before buying! If you have any questions or problems with your order or anything that will prevent you from giving me 5 star ratings and positive feedback, please let me know so I can address it. I am proud to be a good seller and want to earn the highest ratings possible. Thanks!